I am in love with Singapore and all her beauty. Look at how much she has grown over the last 50 years to one of the top metropolitan cities in the world. We ought to be proud of her success, and should strive to do likewise for ourselves. Singapore wouldn't be a country I'm so proud of today if it wasn't for our government. I grew up in a family where my parents and all my relatives were part of the hospitality and tourism industry. Hence it has always been in my nature to enjoy being of service to others, which explains why I've always wanted to be a part of Singapore Airlines as a cabin crew. Many say that joining the service industry is one of the most terrible things you could do to yourself, but I beg to differ. I think that as long you can find joy in putting a smile on someone's face, you can definitely look forward to work every day. In fact, you might enjoy it so much that it won't even feel like work! In my opinion, Singapore's tourism industry has grown significantly over the past few years and I've only realized today that part of it is thanks to healthy competition set by the Singapore Experience Awards. Only through such competition would one strive to work harder and smarter to bring the best out of themselves. The Awards takes place annually and honors outstanding experiences offered by individuals and organizations. So what qualifies an organization for one of these awards? 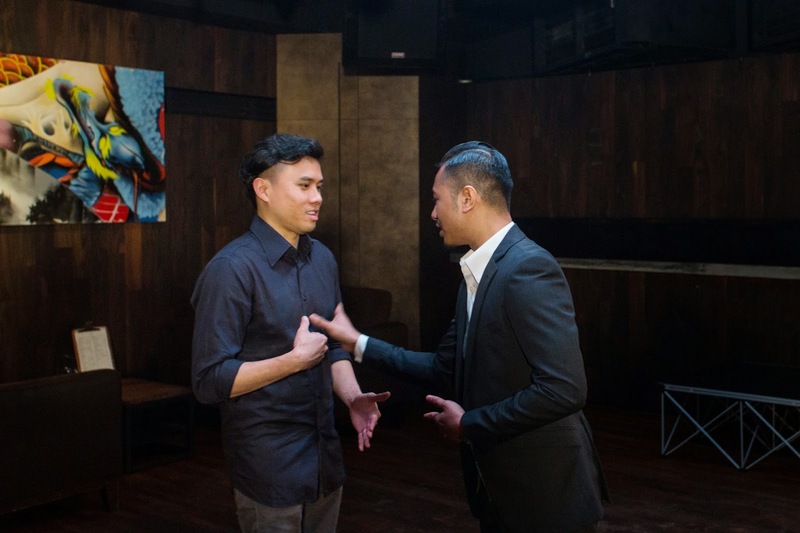 Well, I got the opportunity to take a look inside what goes on behind the scenes of one of this year's finalist - a local bar and club called kyō. 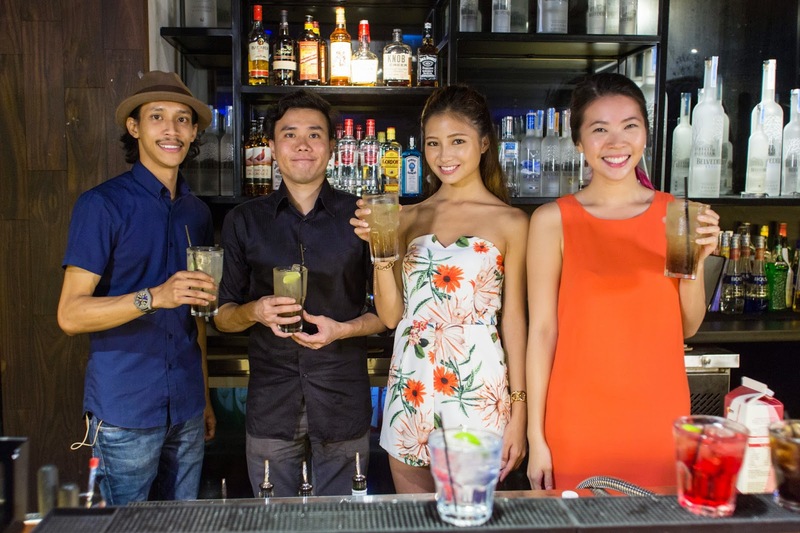 The Central Business District (CBD) is a place you'd least expect a club but take a stroll along Cecil Street at night and you'll be surprised to find a bustling underground club. 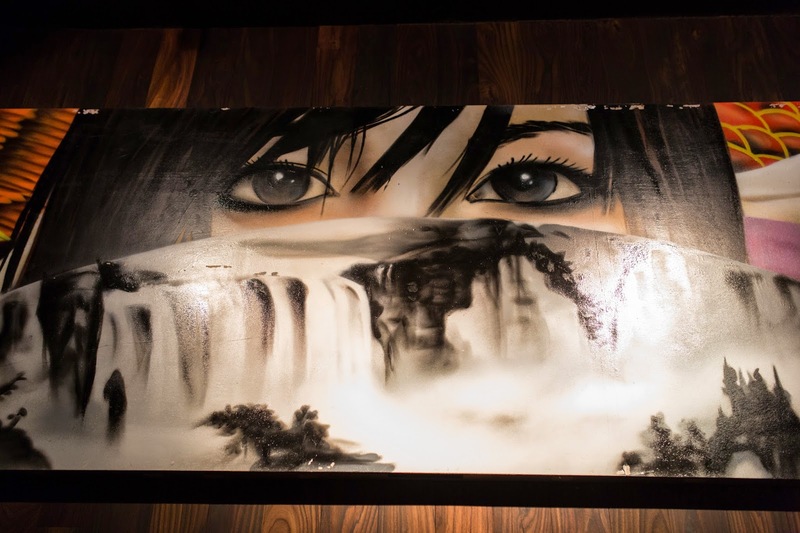 Thanks to its one of a kind uniqueness, kyō is a favorite nightspot for many. 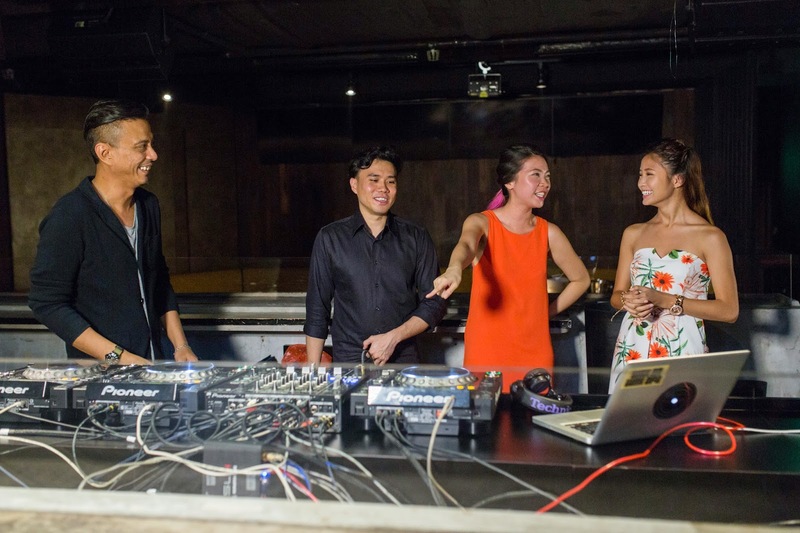 It houses the longest bar in Singapore (27 metres long) and an 8m long DJ console that regularly features local musicians and DJs. A bank formerly occupied the spot and when asked why they chose that location, kyō said that they want to be a getaway from the busy district above. 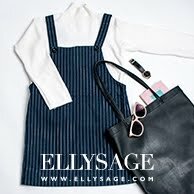 They want to offer their guests a different and relaxing atmosphere from the stressful and busy work life. 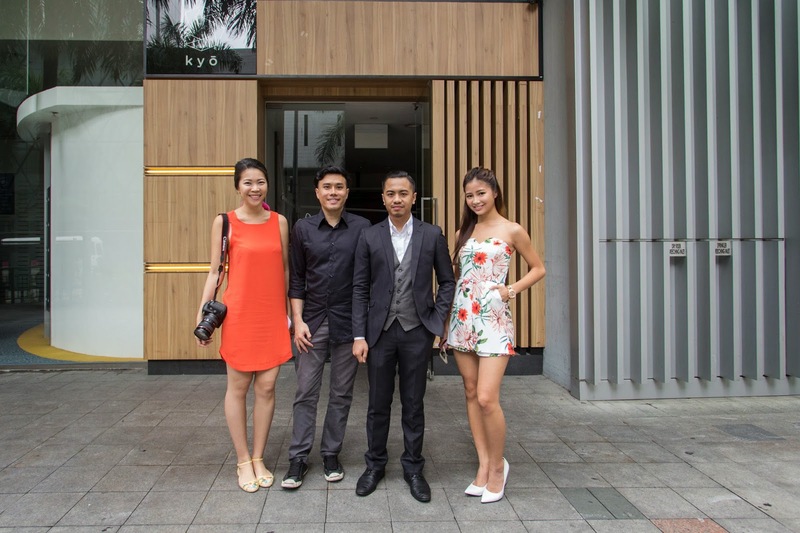 As its name suggests, kyō is injected with Japanese flavour throughout their interior, making the entire place feel a lot different from most clubs. This is well reflected in their service as well. Let's take a further look into how their day-to-day operations go shall we? 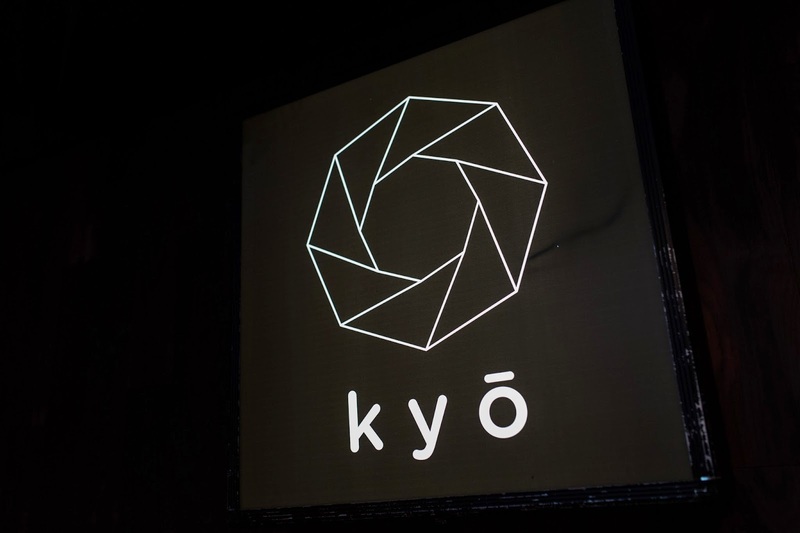 I've never been to kyō on a normal night before but I've visited quite a good number of clubs to safely say that the way kyō's security operates is TOTALLY different from what I'm familiar with. The tough guys at the door of every club, a.k.a bouncers, aren't always the friendliest people around and you can't blame them. They have to put up that facade to keep the crowd in control but what kyō does with its security operations took me by surprise. 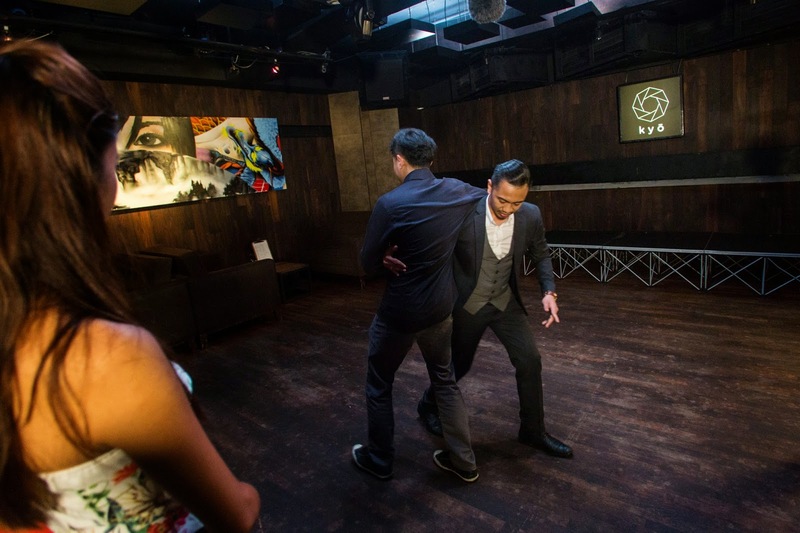 Instead of being firm with the guests all the time, the bouncers at kyō are taught to befriend them. They say that this fosters mutual respect between security and the guest thus reducing any problems throughout the night. Now, don't you think it'll feel so good to be greeted with a friendly smile at the door compared to what most of us have experienced so far? Having said that, it's not always easy for these guys. 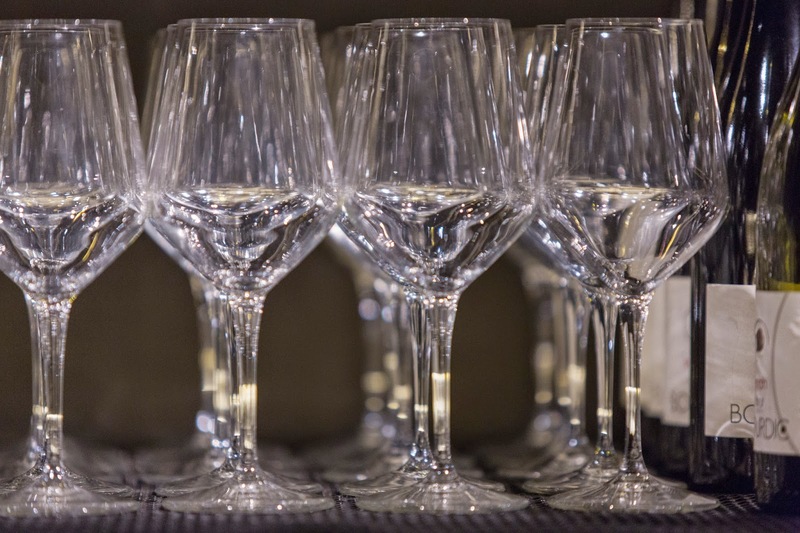 There are times when they have to face difficult situations where guests aren't cooperative. We often overlook their importance when ironically; they are the most important people at a nightspot. We also had a self defense lesson from the Head of Security, Din, at kyō. Seth learning a couple of self-defense tricks the security team would use on uncooperative guests. 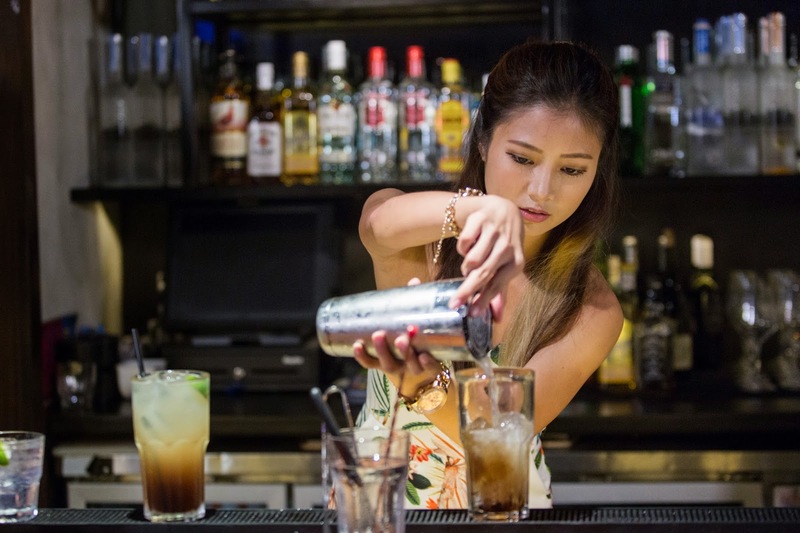 Next, one of the most important elements to a good bar/club is the drinks. 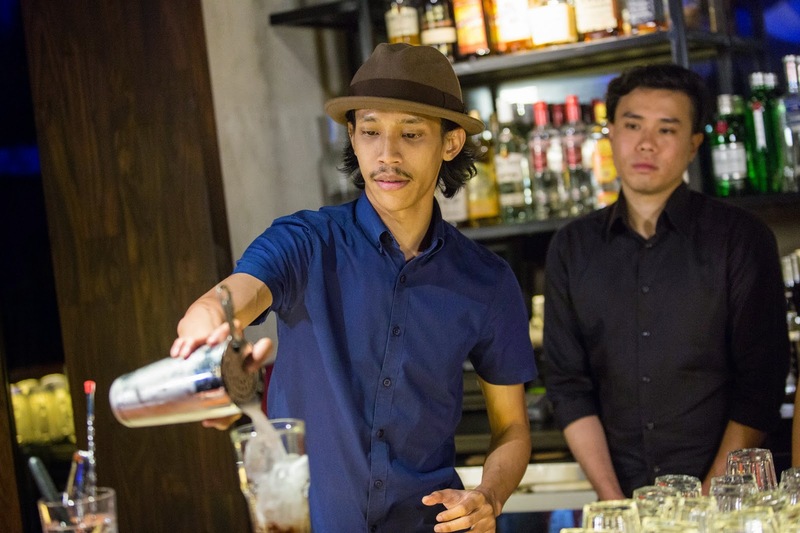 The great thing about kyō's bar isn't just its length; it's also the person standing behind it serving the customers. 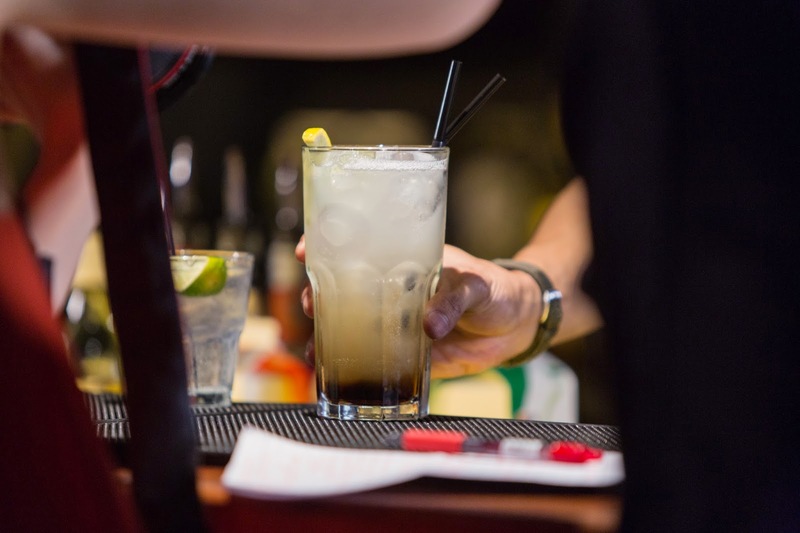 We learned from the Bar Supervisor of kyō, Matt, that the bartenders at kyō are only allowed a maximum of 1 minute to make a drink, while at the same time keeping a conversation with customers. 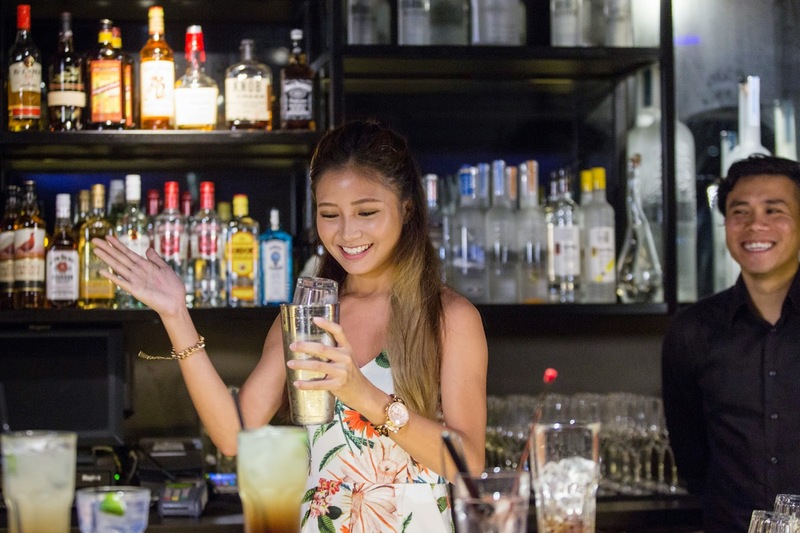 kyō emphasizes good customer service, and doesn’t rush through making the drinks just to get everyone off the bar quickly. They smile and interact with the guests as much as possible while they work. Matt even mentioned that sometimes they receive invitations to party and drink with the guests after their shift ends! That's definitely something I've NEVER experienced at the other clubs I've been to. Most of the bartenders I've met so far are either rude or are only giving me free drinks for the wrong reasons. I think I would pay kyō a visit some day; they seem to pay really close attention to the customer service, and also the kind of bartenders they hire here. The coolest part of every club to me! The DJ console! Everyone wants to get into the DJ booth and party the night away. It almost seems as though you’re a V.I.P if you ever get to be in it, while everyone else is squeezing like sardines on the dance floor huh? Being a DJ is so cool, you get to control the mood of the entire club, and you also have the say of what to play for the entire night but we never stop to think about how stressful it can be. Every DJ is unique in their own way and they all have their personal preference and taste in music. You can't just come up to the console and request for music of your choice, do that to a jukebox, not an artist. The way I see it, you can't take the paintbrush away from a painter, so don't try to control the decks in the club. I've learnt that when a DJ ignores you, he/she isn't being arrogant or rude; they just need to concentrate on mixing the next tune in. And sometimes, that's tough. I know because I got a chance to try it out at kyō! 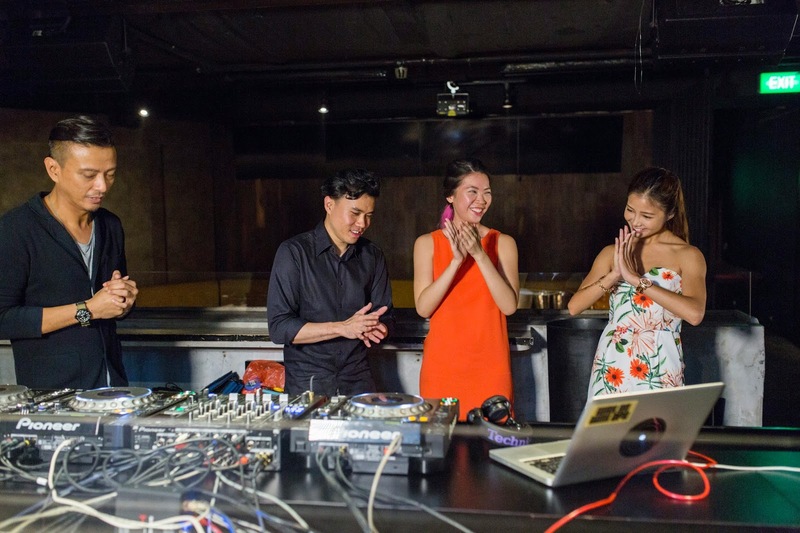 Kenneth Francis, the Entertainment Manager of kyō, issued us a challenge to mix tunes and learn to do what a DJ does! There was actually some friendly competition between Seth, Noelle, and I. And guess what? After 3 years of being in a relationship with a DJ, I won! hehehe. I've watched Fai mix in tunes tons of times so I think I kinda have the basic foundation. HAHA. Or at least, I think I do. Never ever take the people that create an eventful and enjoyable night for you lightly. For without their service and presence, the club you so love and have an enjoyable night at wouldn't function properly. kyō has really captured my attention and appreciation, and I genuinely respect their culture and like-mindedness. 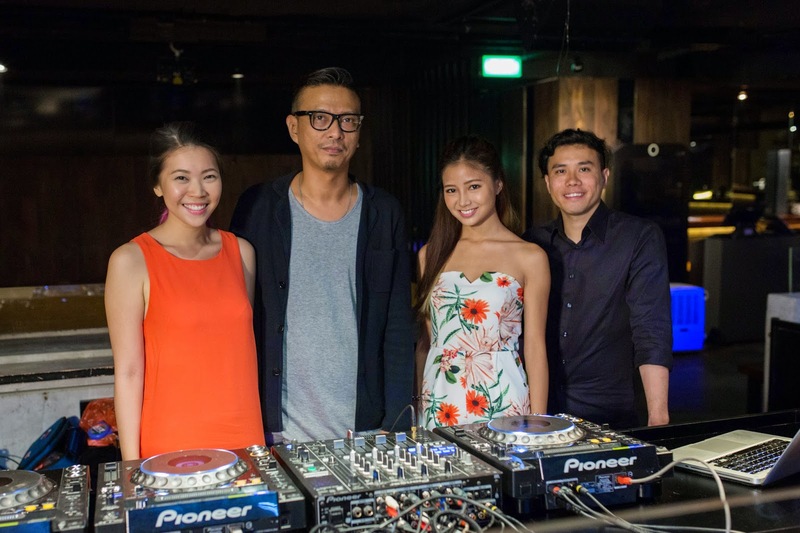 What makes them different is how they aren't just focused on earning big bucks from their spenders, rather they place a strong emphasis on the culture, genres of music, customer service and overall club experience. Also, I truly enjoy the sort of music they play; it's not the sort you can find anywhere else in Singapore. Though I've never been to kyō before that day, I'm rooting for them to walk away proudly with the "Best Nightspot Experience" award on 31 October 2014. My experience with them was truly an eye-opener! I can't wait to dress up and attend the event as well, and meet all the exceptional people of the tourism sector.